WW1 Reenactments Equipment : Great War Tommy WW1 Documents, Paperwork : 1904 Shooting pamphlet cover. 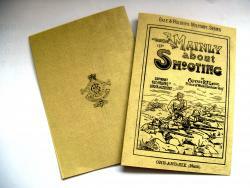 WW1 Reproductions and WW1 Reenactors Equipment / Kit - 1904 Shooting pamphlet cover. "Mainly About Shooting" booklet cover by Captain R.F. Legge of P.O.W.s Leinster Regiment published by Gale & Polden in 1904. Cover features Boer War period British Mounted Infantry in bandoliers and slouch hats.